As North American sewing machine suppliers go, Sears Roebuck & Co. was second only to the Singer Manufacturing Company. Unlike Singer, Sears Roebuck was a mail order supplier and relied on contracts with various sewing machine manufacturers to supply and rebadge their machines. The White Sewing Machine Company was one such manufacturer. Over the years, White grew in prominence and eventually became the sole sewing machine supplier for Sears Roebuck. Early Kenmore branded machines were in essence, White Rotarys in disguise. White machines were highly regarded and often considered comparable in quality to Singers. This is a Kenmore 117.720. And while it is a Kenmore by name, the 117 designation means it was made by White. This angular, no frills, precision built, straight stitcher not only looks like a tank, but is built like one too! There is very little slop in this machine, unlike more modern Kenmores. If you're accustomed to vintage Singers, you'll find that the White Rotarys behave a bit differently. For starters, the hand wheel on these machines turn in the opposite direction! Instead of turning toward you, you turn it away from you to sew. Additionally, this Kenmore uses an old style presser foot that screws on via a two pronged attachment point. This type of presser foot was common in older machines before the ubiquitous low shank foot was developed. The 720 also features a quad feed dog configuration that feeds exceptionally well in both forward and reverse. It is very similar to the configuration found on my industrial Singer 491. This machine is capable of creating perfectly matched forward and reverse stitches thanks to its exceptionally well designed stitch length regulator. The regulator features a spring loaded thumbscrew that locks the maximum allowable stitch length. This enables the operator to easily flip between forward a reverse with perfectly matched precision. There are two quirks of note. The machine stitches forward when the lever is in the up position and in reverse when the lever is in the down position--opposite to what one might expect from a more modern design. Furthermore, the machine is capable of a longer stitch length going forward than in reverse. Like on most older machines, I find the maximum stitch length is a little lacking. As the name White Rotary suggests, this is a side loading rotary hook machine. The bobbin case threads a bit differently and takes a bit of maneuvering to coax your thread to go between the bobbin tensioner. Unlike more modern bobbin cases, this one does not have a locking mechanism to hold the bobbin in the case, so loading the bobbin case into the machine can prove challenging as well. The hook and race cover all detach via a series of spring loaded levers. All of this feels super robust as there is absolutely no plastic to be found. Another interesting feature is the belt-less friction wheel used to drive the hand wheel. The motor is mounted via a hinged spring and can be easily tipped back should you decide to remove the hand wheel. The motor has a bit more oomph than most Singer motors of the era weighing in at .8 amps. I was quite skeptical at first but was surprised at how fast this sewed. My laser tachometer clocked this topping out at 1050 stitches per minute. Not too shabby! Different machines will have a varying number of thread guides that are threaded either before you hit the tension, after the take-up or anywhere in between. Those are easy to figure out so long as you make sure you go through your tension discs first (and check spring) before you thread the take-up lever. From there you pass through more guides before threading the needle. Easy peasy! 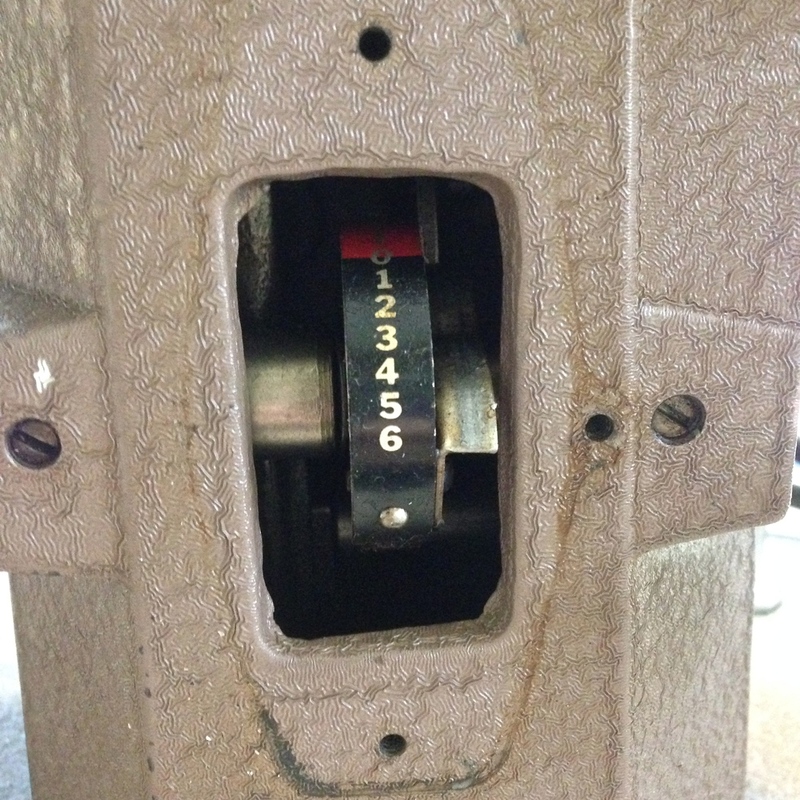 The 720 uses a clearly labelled lever to regulate the upper tension found on the front of the machine. Here's another odd design feature. Both the needle bar and the presser foot bar are attached to the the nose cover of the machine. Usually, the cover is just that, a cover. So you can imagine my surprise when the needle bar connecting arm fell off as I removed the cover! No biggie, it's easy to reinstall. As you can see, this is about as bare bones as you can get. All in all, I am quite impressed with the speed, and excellent feeding ability of this machine. While I do find the short maximum stitch length somewhat limiting, the real kicker, however, is the reversed direction in which the hand wheel turns. If you can live with these quirks, I think you'll find the Kenmore 117.720 to be a fine addition to your collection.